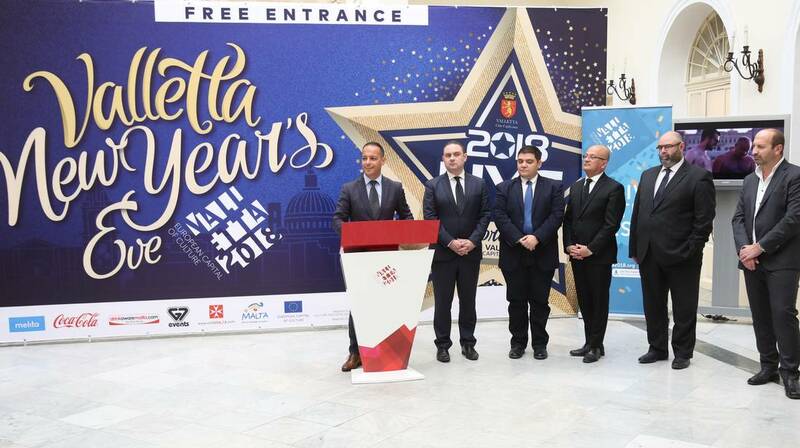 Valletta 2018 Chairman Jason Micallef, Minister for Justice, Culture and Local Government Owen Bonnici, Valletta Mayor Alexei Dingli, MTA Deputy CEO Leslie Vella and G7 Events Director Owen Spiteri during a press event for the Valletta NYE Celebrations. Following the success of the last few years, Malta now boasts a well-established New Year’s Eve national celebration. This year, the festive event is a a special one for Malta as it welcomes the year 2018 when Valletta will be hosting the European Capital of Culture festivities. St. George’s Square will once again host the main stage boasting some of Malta’s top local artists and bands. Furthermore, this year’s edition will host some innovative international attractions including performance and visual art. The line-up for the night includes special international guests EMBER TRIO, a new age string trio who combine a unique blend of classical and contemporary production elements which have elevated them to become Europe’s most successful classical crossover string trio. The line-up includes Brass House Unit who will also feature Gianluca Bezzina, Ozzy Lino and Gloriana as well as Kim & the band. The event will be hosted by Corazon Mizzi and Owen Bonnici. Then it’s time for the energetic countdown and 3D architectural countdown to welcome the New Year. Finally, DJ Mykill and trumpet Live will close off the night.